The challenge facing many office	buildings is finding a company that can provide security guards that can work with existing security systems (cameras, procedures, and personel), the demands of their tentents (which can vary depending on whether they are public, private, or goverment); and the location of the building (downtown or secluded). Another challenge is finding a company that can handle the different technologies available in assisting guards in doing their jobs. 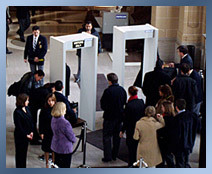 Some of those technologies include walk-through metal detectors, hand-held detectors, bar-code scanners, video monitoring systems, and alarm systems. We have experience with all those technologies and spend time keeping track of new ones.